Preheat the oven to 375. Lightly mist a 7 x 11 baking dish with cooking spray and set aside. 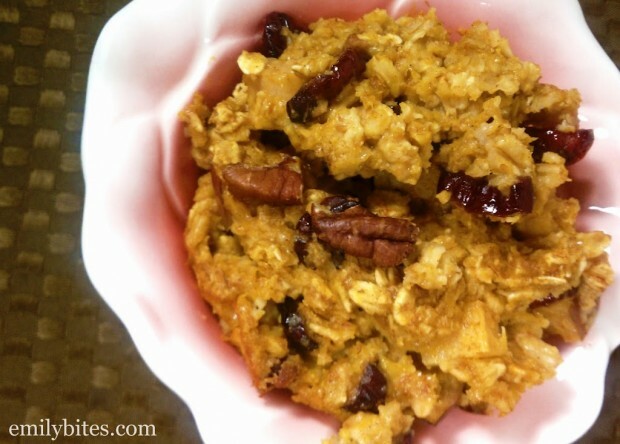 In a large bowl, combine the oats, wheat germ, brown sugar, cinnamon, salt, baking powder and cranberries and stir to mix. In a separate bowl, stir together the milk, pumpkin, butter, egg and vanilla. Add the wet ingredients and apples to the dry ingredients and stir until thoroughly combined. Pour the mixture into the prepared baking dish and spread evenly. Sprinkle the pecans over the top and bake for 20 minutes until top is golden. Slice into eight pieces and serve. This looks so yummy!! Does it store well? I’m wondering if I can make it at the beginning of the week and have 1 serving each morning for breakfast that week. Thanks! Yes! I am doing that this week as well :). I just microwave a serving each morning. I haven’t made it without the wheat germ but my guess would that it would still taste great. Let me know! I wish I found your blog earlier! I made some baked oatmeal this morning using applesauce, and served it with sliced banana and warm milk. Delicious! Like you said, I love how this breakfast lends itself to all kinds of flavors. Thanks for posting! Thank you! I made a wonderful baked blueberry oatmeal a while back. It was so many point though. I am very excited to try this one! How much apple did you use and what type? Susie, the recipe calls for 1 cup chopped apple. I think I used a gala apple. I bookmarked the recipe. Thanks for sharing! Hi. I plan to make this tomorrow morning but don’t know how the 1 1/2 T of unsalted butter figures into it. Did I miss something? Should I coat the pecans? Thanks for the recipe! Oops, I left it out of the instructions! It goes in with the rest of the wet ingredients. I just added it. Thanks for catching it! Love this recipe! I’ve made it 3 times in the last 2 weeks. It’s super easy and so yummy. Thanks! Thank you for the answer to the butter question. When I got up and thought about it I decided to add it to the wet ingredients, and then I made it in muffin cups for portion control!! It is delicious. Thank you so much for the recipe. Made this for the second time it is amazing! 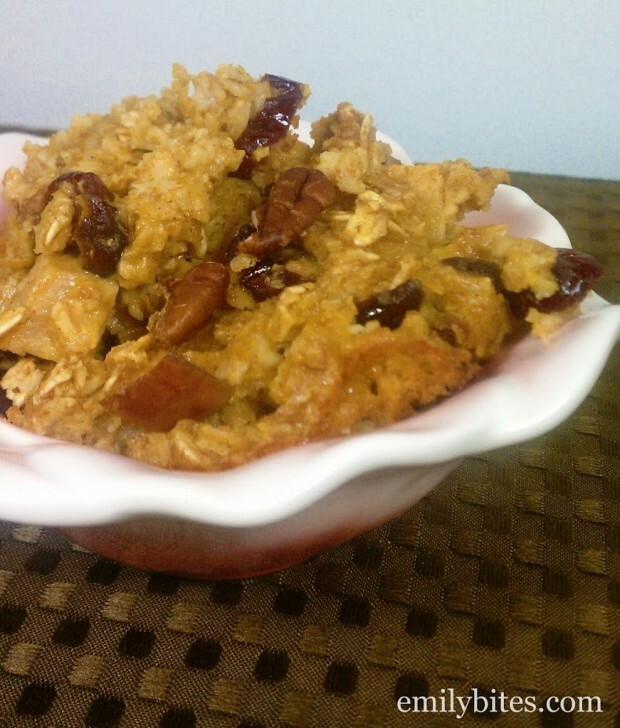 This is the best baked oatmeal recipe ever! Just finsihed making this. I was hoping for more pumpkin taste it in it, and a bit more sweetness. Would you suggest adding some splenda to it? Sara – sorry you didn’t like it! I would never recommend adding splenda to any baked goods because I think it has a weird aftertaste. I thought this had plenty of pumpkin flavor and sweetness from the brown sugar so I’m not quite sure how to help. It’s not supposed to be overly sweet like dessert. If you want to add splenda then go ahead! i never baked w splenda before so will take your word for it. I still liked it tho!kept well in the fridge and tasted great microwaved in the morning! I just made this tonight for dinner and it is sooo good.Strangely, I had no brown sugar so I used the splenda brown sugar blend and it turned out great. I love your recipes! So delicious. Has the texture of bread pudding. So good. At first i thought the portions were too small but once i ate it, it was filling. Perfect size and healthy. Love how the pecans toasted on top too. Added a nice crunch. Will make again! It’s a keeper! Awesome, so happy you liked it! Baked oatmeal is deceiving that way. A small portion is super filling! Have you ever tried this recipe “muffin” style? I am just wandering if it would work that way. I love the recipe–have made it many times, but have not tried it as muffins. I have not tried it that way, but I’m sure it would work great. If you try it, let me know! I made this today and it was so fantastic!!! WOW! My three sons even liked it. I didn’t have a few ingredients but it was still so yummy. I substituted rasins for the cranberries, walnuts for the peacans and flaxseed meal for the wheat germ. I like that you can make it and eat it throughout the week. Thank you for the great recipe. It’s a keeper. I’m a new follower to your site. You do a great job! Thanks Missy, I’m glad you found me! 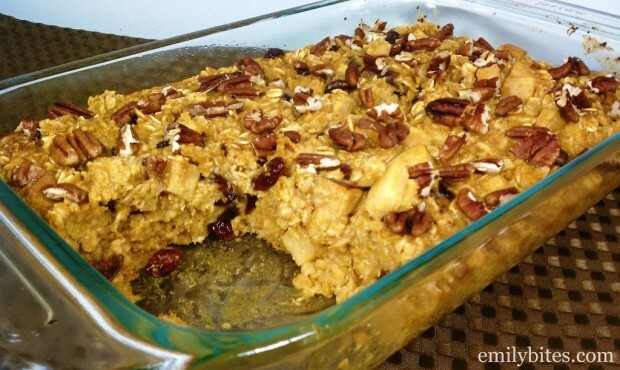 I love baked oatmeal, it’s so filling and versatile. Your substitutions sound yummy. So happy to hear this was a hit! Has anyone frozen the portions? Yes I’ve frozen them and they taste and hold up just fine. YUMMY!!!!!! just made some last night and had some this morning! Tastes great and also great for people who have to get to work early and cant make breakfast!!!! I also put a couple t of flaxseed in mine. Any other way I can make this to switch it up every week? thanks! I have made this many times and love it. I’ve made it for family and friends and always get rave reviews. When I made it earlier this week, I discovered too late that I was out of milk. I subbed unsweeteded vanilla almond milk instead and it was just as good–there was NO differerence in taste or texture, but it cut it down to 5 points per serving according to the recipe builder. That was an accidental bonus! THANK YOU! this is now my official go to breakfast, my boyfriend can’t get enough of it. You’re the best! Emily, you make my mornings so much easier. I’ve done several batches of the Banana Oatmeal Singles to freeze and reheat on crazy mornings, so last night I tweaked this just a little to make it into singles. I left out the wheat germ (because I didn’t have any), and cut the milk back to 1 cup. I portioned it into 12 muffin singles, and baked at 350 for 18 minutes. They are so moist with the apples, and the cranberries add a nice punch. We all enjoyed them for breakfast this morning, and now I have 9 more stashed in the freezer. Thanks! I am brand new to your site and I LOVE it! This was the first recipe I tried and I was blown away! I loved all of the flavors and the sweetness, and the heartiness is just what I need to fill me up and keep my 10:30am munchies at bay. I love all of your ideas, and can’t wait to try all of your recipes! Thanks! OMG, these are even more addictive than your wonton cupcakes! I followed the ingredient list exactly and they made 6 regular cupccakes (baked @ 30 mins) and 24 mini ones (baked at 20 mins). Thanks so much for the recipe! This is fantastic! I made it with fresh cranberries and quick oats but am making again today with old fashioned oats. Very simple and a great way to use some of my fav fall ingredients. I used coconut oil instead of butter and replaced the wheat germ with flax seed meal. Just made this and tasted it straight from the oven..wow – so good! Emily–this looks delicious !!! how would the NI change by using margarine and also omitting the nuts ( family member with tree nut allergies..) ? thanks so much !! I’m not sure, it would depend on the margarine you use, etc. I recommend plugging in the ingredients with your changes to the nutrition calculator on myfitnesspal.com! Emily–this , as well as all of your baked oatmeal recipes, look so yummy….Can any/all/some/none of them be prepared the night before and baked in the morning???? If so what , if any, changes need to be made to the recipe incl baking time ??? thanks so much ! Would the consistency change if I omitted the wheat germ? I’ve been making your blueberry peach oatmeal for quite some time now. I finally gave this one a try this week and it’s over the top yummy! Thank you so much for your recipes! !